An artist's rendition of the TRAPPIST-1 system (not to scale). A new study shows that three of the planets in the habitable zone do not appear to possess hydrogen, which means their atmospheres could be similar to those of rocky planets, although that doesn't guarantee they are habitable. The TRAPPIST-1 star system is home to seven Earth-size planets, and a new study suggests that 3 of those planets' atmospheres look similar to atmospheres found on rocky planets such as Venus or Mars. Using the Hubble Space Telescope, astronomers targeted the planets in the TRAPPIST-1 system that lie in the star's "habitable zone," or the region where temperatures could be right to host liquid water on a planet's surface — a critical ingredient for life as we know it. Hydrogen acts as a greenhouse gas, which traps heat inside a planet's atmosphere. For planets in the habitable zone, a hydrogen-rich atmosphere would render the surface extremely hot and unfriendly for life. Hydrogen is more abundant in gas-giant planets in Earth's solar system, compared to rocky planets. Neptune, for example, has a very "puffy," hydrogen-rich atmosphere, according to the statement. A lack of hydrogen means it's possible that the TRAPPIST-1 planets have atmospheres that are "shallow and rich in heavier gases like those found in Earth’s atmosphere, such as carbon dioxide, methane and oxygen." The three TRAPPIST-1 planets appear to have little hydrogen today, according to spectroscopic observations with Hubble's Wide Field Camera 3, but the study authors said it is possible that the planetary atmospheres contained hydrogen shortly after they formed. This suggests the planets' atmospheres are closer in composition to those of the larger rocky planets in Earth's solar system: Venus, Earth and Mars. All of the seven TRAPPIST-1 planets orbit closer to their parent star, TRAPPIST-1, than Mercury orbits the sun. Because TRAPPIST-1 is a dim red dwarf star, however, its habitable zone is much closer in than the habitable zone around the sun. In the new paper, the researchers emphasized that more work is needed to understand what kinds of atmospheres surround the TRAPPIST-1 planets. NASA's powerful James Webb Space Telescope, which is scheduled to launch in 2019, should be able to get a better look, because TRAPPIST-1 is relatively close to Earth — just 40 light-years away. Webb will search for elements such as oxygen and compounds such as carbon dioxide, methane and water. Specific combinations of those molecules could indicate that a planet is habitable for life as we know it, or the likelihood that life is already present, according to the statement. "Hubble is doing the preliminary reconnaissance work so that astronomers using Webb know where to start," study co-leader Nikole Lewis, an assistant astronomer at the Space Telescope Science Institute (STScI) in Baltimore, said in the statement. "Eliminating one possible scenario for the makeup of these atmospheres allows the Webb telescope astronomers to plan their observation programs to look for other possible scenarios for the composition of these atmospheres," she said. The lack of hydrogen does not directly imply that the planets are habitable, however. Their atmospheres could be oppressively hot, like that of Venus (which suffers from a runaway greenhouse effect) or extremely lightweight, like Mars' atmosphere (which is so thin that water can't flow on the surface). "One of these four [TRAPPIST-1 planets] could be a water world," Hannah Wakeford, a fellow at STScI and a co-author of the new paper, said in the same statement. "One could be an exo-Venus, and another could be an exo-Mars. It's interesting because we have four planets that are at different distances from the star. 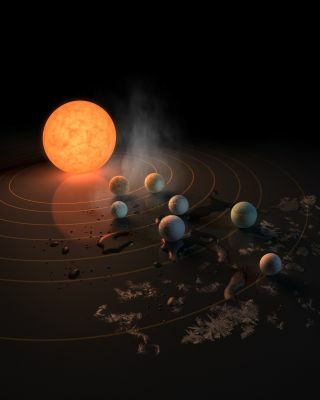 So we can learn a little bit more about our own diverse solar system, because we're learning about how the TRAPPIST star has impacted its array of planets." The new study was published yesterday (Feb. 5) in the journal Nature Astronomy. TRAPPIST-1 made headlines last year after NASA's Spitzer Space Telescope and other observatories confirmed the existence of seven rocky planets in the system. Four planets were announced last year as a part of that study, and the other three planets were discovered in 2016 by the European Southern Observatory's (ESO) Transiting Planets and Planetesimals Small Telescope (TRAPPIST) in Chile, according to NASA. Hubble also did a previous hydrogen study of TRAPPIST-1b and 1c in 2016. A separate study published today in the journal Astronomy & Astrophysics suggests that some of the TRAPPIST-1 planets host a lot of water. Several ground-based and space-based telescopes surveyed the seven planets, estimated their density and determined that they are mostly rocky, with some of the planets holding up to 5 percent of their mass in the form of water. That's roughly 250 times more than what Earth's oceans hold, according to a statement from the ESO. "The hotter planets closest to their parent star are likely to have dense, steamy atmospheres, and the more distant ones probably have icy surfaces," ESO representatives wrote in the statement. "In terms of size, density and the amount of radiation it receives from its star, the fourth planet out [TRAPPIST-1e] is the most similar to Earth. It seems to be the rockiest planet of the seven, and has the potential to host liquid water."